These Healthy Meal Prep Bowls SCREAM summer! I’m hitting you with one of my healthy meal prep ideas today so you can prepare everything ahead to take stress out of your week. 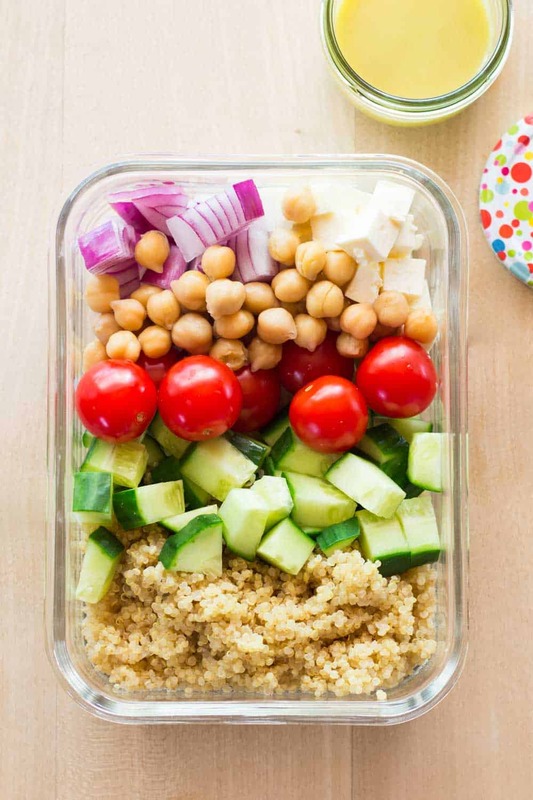 Chickpeas, quinoa and plenty of veggies make this a super easy healthy meal prep recipe. We have crunchy fresh cucumber, cherry tomatoes that taste like they ripened in the sun in my dad’s garden, quinoa, cold chickpeas, soft and salty feta, spicy and crunchy red onion and the most delicious lemon tahini dressing EVER! 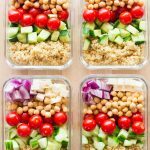 Healthy lunch meal prep has never been easier! I love making healthy lunch bowls for my work week because they keep my energy up and help me keep mood swings at bay. I cook chickpeas in my Instant Pot once a month and freeze them in 2 cup portions so they are easy to just take out and throw in my meal prep bowls for work. I cook quinoa in my instant pot, too. Quinoa cooked in the instant pot tastes out of this world! Quinoa, chickpeas and fresh crunchy vegetables are the perfect combination of taste and texture. Plus, they are super nutritious! Get in your protein with the chickpeas and feta, your carbs with the quinoa and as always, fill half your plate with veggies. Top it all with an out of this world Lemon Tahini dressing that brings summer to your lunch time. 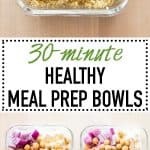 Healthy Meal Prep Bowls for Work….easy peasy lemon squeezy! That’s just one recipe though, the healthy Meal Prep Ideas are endless. I know you are probably tired of hearing it time and time again here on Green Healthy Cooking. I will talk about it incessantly though. The key to “sticking to” a healthy diet is meal prepping. Healthy Meal Prep Bowls are the solution to avoiding eating unhealthy. 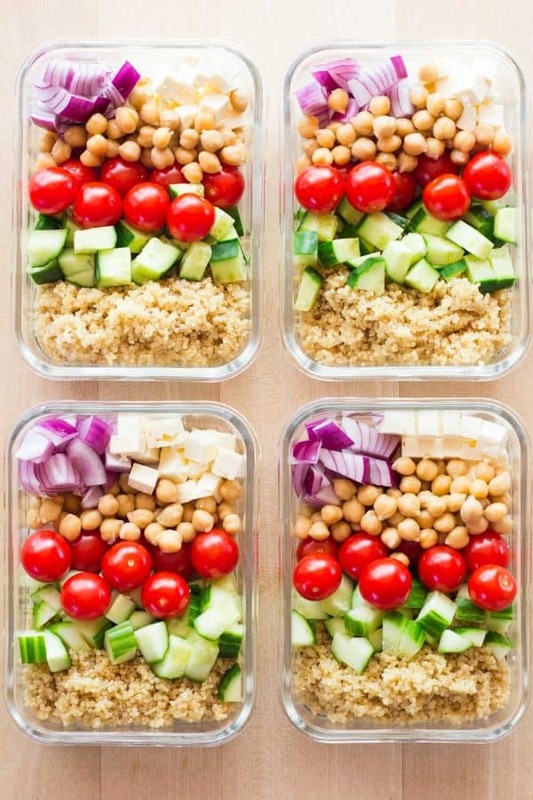 For more healthy lunch ideas check out my healthy lunches e-book :) And for advice on what lunch containers are the best for taking your healthy meal prep bowls to work, check out this post and scroll to about the middle. I'm hitting you with one of my healthy meal prep ideas today so you can prepare everything ahead to take stress out of your week. 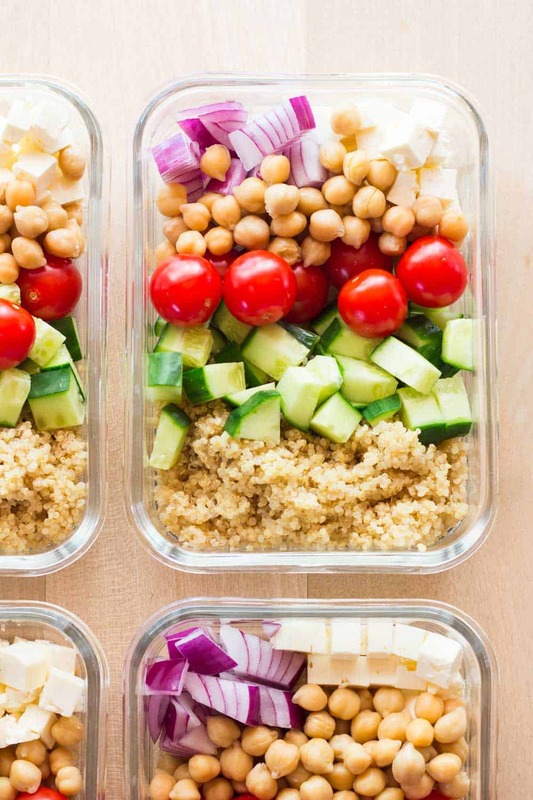 Chickpeas, quinoa and plenty of veggies make this a super easy healthy meal prep recipe. Cook quinoa as instructed on package or cook it in the Instant Pot by preheating the instant pot with the "sauté" button, then once hot add a splash of oil and the quinoa and toast it for a couple minutes. Then, add water and sea salt, and immediately put on lid and seal. Make sure the venting knob is set to sealing. Press "cancel" and then "manual" and set the Instant Pot to 1 minute on high pressure. Then wait for natural pressure release (about 15 minutes). In the meantime, wash and cut vegetables and divide all ingredients in 4 parts and add to 4 large bowls. Prepare salad dressing my mixing lemon juice, tahini, honey and olive oil in an airtight container and shake until well combined. Once quinoa is cooked, let cool and then divide into 4 parts and add to bowls. Immediately refrigerate and take 1 bowl to work with about 4th of the dressing. 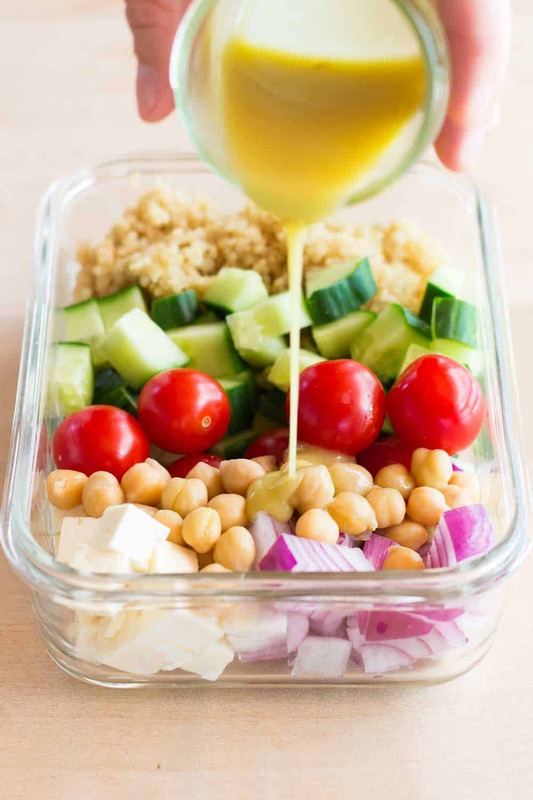 Add dressing to bowl minutes before eating. First off, the meal itself is beautiful. Secondly, it was super easy to make!! Last, it was DELICIOUS! Very filling (didn’t even finish it all) and I substituted the red onion with red pepper because I’m not too big on raw onion. Otherwise, a perfect healthy meal. Thank you! You are very welcome :) I’m so happy you enjoyed it!! Looks yummy and healthy but the recipe would be more useful if it described a different way of preparing chickpeas and quinoa (for weirdos like me who don’t have the Instant Pot). I state in the recipe to cook quinoa “as instructed on the package” OR “in the Instant Pot”. If you don’t have an Instant Pot cook it as instructed on the package you bought it in. The recipe also asks for “cooked chickpeas”. I’m informing about the possibility to cook them in the Instant Pot but you can use canned, cooked in a pot, cooked in a slow cooker, whichever way is your favorite. But you are right, I definitely deserve 2 stars for a recipe you haven’t tried. Hi Karen, just chickpeas or legumes in general? Have you tried with using dried, soaking 12 hours and then cooking yourself? Are you vegan/vegetarian? Where do you get your glaas prep bowls from? Is that 1 cup of quinoa before or after cooking? 1 cup uncooked which then becomes about 2.5-3 cups cooked. Thank you thank you a lot! this is an amazing idea!I highly recommend everybody!! Is the calorie count 800+ each, or is that info for the whole recipe? It’s 800 per bowl Maggie. Chickpeas have quite a few calories. Still a healthy amount of calories for a person on a 1,800-2,000 calorie diet and 3 meals per day. Are you cooking canned chick peas? I’m not super familiar with chick peas that’s why I ask. Hi Jessica, for the most part I use homecooked chickpeas. However, in rare occasions when I don’t have any on hand and am in a rush I’ll choose canned. Canned chickpeas are already cooked. You just have to drain them and rinse them and they’re good to eat. If you want to cook them yourself, you should soak them in plenty of water overnight on your kitchen counter. Then drain and rinse, then either pressure cook with enough water for approximately 22 minutes on high pressure plus full natural pressure release. OR in a pot with plenty of water, bring water to the boil, then reduce to simmer and cook covered for approximately 2 hours. I just came across your Instagram today, while trying to follow a healthier lifestyle. Loving your recipes,and excited to start and taste them. Also, wondering have you ever tried substituting quinoa with bulgur wheat. Bot sure if it’s considered a carbohydrate. I’ve looked into it but unclear. Please let me know what you think. Hi Liz, bulgur is higher carb an lower in protein but still in my opinion VERY healthy. If you don’t have issues with gluten definitely a great substitute for quinoa. I will try and update my Instagram more often. I’m terrible at posting there. My Facebook is way more active. Where did you get the little glass jars, so cute! I think I’m going to try Italian dressing instead, it has fewer calories but I love this, thank you. Lorena, thanks for this recipe. Absolutely DELISH and super EASY!!!! I’m so happy you liked it!!! It’s high in sodium and carbs. Do you have a version that’s diabetic and heart friendly? Calories 841… is that each bowl or total for all 4??? That’s for 1 bowl. It is very filling. How long does the dressing last? Can it be frozen? I froze the bowls but I don’t know if I can put the dressing in little containers and freeze those or if I should just keep them in the fridge and use them over the next two weeks or so (as I use the bowls). Thoughts? PS- great recipe! Thank you so much for sharing it! Hi Lauren, freezing sounds like a great idea. Since the dressing contains freshly squeezed lemon juice it doesn’t last that long. Just 3-4 days in the fridge. Other than that you could replace the lemon juice by rice vinegar and than keep it in the fridge for much longer. 826 calories per serving ? Is that right ? I’m making these tonight for my hubby’s lunches for the rest of the week. So far, I can tell you that this dressing is terrific! How amazing Cathy!! You have no idea how happy it makes me when other bloggers make a recipe of mine. It’s such an honor!! !